Stay warm in winter with new High Visibility flying jackets and the new 4 in 1 jacket. 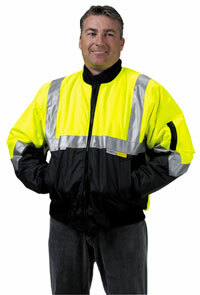 Elliott Australia has added 6 new high visibility jackets to keep your warm and safe in the cold. All jackets are manufactured to meet the requirements of AS/NZS 4602:1999 High Visibility Safety garments Class D or Class D/N. Flying jackets available in two tone Fluoro Yellow/ Navy or Fluoro Orange Navy with and without 3M Australia Supply silver reflective tape. Z40 ? 4 in 1 jackets: The Z40 incorporates a detachable vest, the options are huge! Available in two tone Fluoro Yellow/ Navy or Fluoro Orange Navy with 3M Australia Supply silver reflective tape.